KidZone instructors lead young learners through hands-on activities in science, technology, engineering, art and math, taking education to a whole fun new level. When: Friday, Jan. 5 | 9 a.m. – 1 p.m.
Stella at the Cedar House Sport Hotel in Truckee will serve up four gourmet Italian courses while setting the atmosphere for mingling, a special welcome and cocktail hour. When: Friday, Jan. 5 and Saturday, Jan. 6 | 6-9 p.m. Cost: $97 per person plus tax and service charge. 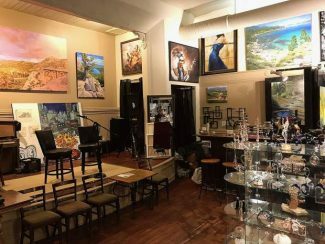 Art Truckee welcomes guests upstairs to their beautiful gallery for an evening showcasing local talent in a performance encompassing a variety of performance art. Beer and wine to be served from the gallery bar for guests age 21 and over. When: Friday, Jan. 5 | 7 p.m.
Join local photographer Grant Kaye’s instruction on the basics of shooting photography using digital SLR interchangeable lens cameras. Participants will learn in Atelier’s workshop before heading outside to practice their new skills. When: Saturday, Jan. 6 | 3-5 p.m.
Squaw Valley Alpine Meadows will celebrate winter in the New Year with fireworks shows every Saturday through March 31. Guests are invited to enjoy a complimentary hot cocoa bar along with the full food and beverage menu offered. When: Saturday, Jan. 6 | 4-7:15 p.m., Fireworks: 5:30 p.m.
Alpenglow Sports brings the largest backcountry demo event in North America to Alpine Meadows, where guests can get a firsthand feel for gear from top name brands. When: Saturday, Jan. 6 | 3 p.m. Cost: Free event with lift ticket or pass, driver’s license and credit card deposit. See a film on legendary climber, Fred Beckey, notorious as a rebel athlete who lived life on the road in pursuit of the mountain lifestyle. When: Saturday, Jan. 6 | 7:30 p.m.
8. Balance and Brews | Yoga + Beer! Alibi Ale Works’ Truckee Public House welcomes yogis age 21 and over of all level and styles to join in a community class including a token to redeem a pint of Alibi beer after practice. Bring your own mat or email Melissa@balanceandbrews.com for an extra. When: Saturday, Jan. 6 | 10:45 – 11:45 a.m.
Northstar California Resort will host a two-day, ladies-only ski retreat including instruction, a yoga session and happy hour in the village. When: Saturday, Jan. 6 | 8 a.m.
Every Sunday through Jan. 28, the Hard Rock welcomes guests to get in touch with their artistic side, painting rock-themed imagery during their instructional class, paired with a complimentary glass of Champagne. When: Sunday, Jan. 7 | 11 a.m.